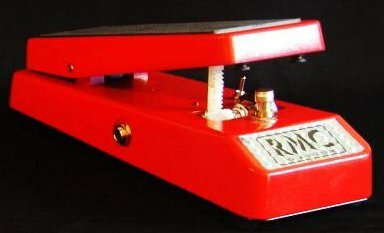 Analog Man sells the RMC5 Wizard wah by Geoffrey Teese. Thie pedal is awesome for people playing harder sounds with hotter pickups! Part RMC1, part PICTURE WAH, the WIZARD WAH sounds like nothing else on the planet, with extended sweep range, rich, yet tight lows, haunting mids, a smooth top end, and a slight overall boost. Unlike the RMC1, the WIZARD WAH is designed to work with any pickup configuration and any amp gain structure. Especially rocks with humbuckers and distortion. Just like all RMC wahs, the WIZARD WAHis designed and built by Geoffrey Teese and includes licensed fuzz-friendly technology, true-bypass, easily adjustable rocker tension, and AC adapter jack, and is covered by their limited one year warranty.